Soil organic carbon (SOC) is a large reservoir of terrestrial carbon (C); it consists of different fractions of varying complexity and stability. Partitioning SOC into different pools of decomposability help better predict the trend of changes in SOC dynamics under climate change. Information on how physical fractions and chemical structures of SOC are related to climate and vegetation types is essential for spatial modelling of SOC processes and responses to global change factors. Soil samples were collected from multiple representative forest sites of three contrasting climatic zones (i.e. cool temperate, warm temperate, and subtropical) in eastern China. Measurements were made on SOC contents and physical fractions of the 0–20 cm soil layer, and the chemical composition of SOC of the 0–5 cm soil layer, along with measurements and compilation of the basic site and forest stand variables. The long-term effects of temperature, litter inputs, soil characteristics and vegetation type on the SOC contents and factions were examined by means of “space for time substitution” approach and statistical analysis. Mean annual temperature (MAT) varied from 2.1 °C at the cool temperate sites to 20.8 °C at the subtropical sites. 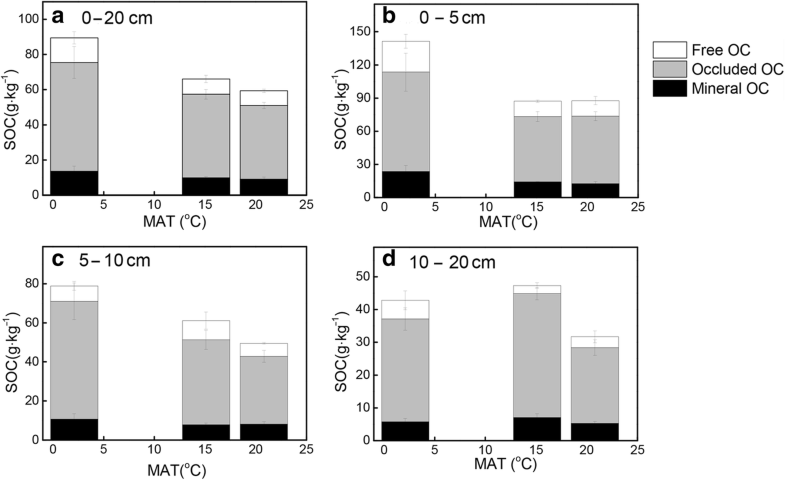 Total SOC of the 0–20 cm soil layer decreased with increasing MAT, ranging from 89.2 g·kg− 1 in cool temperate forests to 57.7 g·kg− 1 in subtropical forests, at an average rate of 1.87% reduction in SOC with a 1 °C increase in MAT. With increasing MAT, the proportions of aromatic C and phenolic C displayed a tendency of decreases, whereas the proportion of alkyl C and A/O-A value (the ratio of alkyl C to the sum of O-alkyl C and acetal C) displayed a tendency of increases. Overall, there were no significant changes with MAT and forest type in either the physical fractions or the chemical composition. Based on the relationship between the SOC content and MAT, we estimate that SOC in the top 20 soil layer of forests potentially contribute 6.58–26.3 Pg C globally to the atmosphere if global MAT increases by 1 °C–4 °C by the end of the twenty-first century, with nearly half of which (cf. 2.87–11.5 Pg C) occurring in the 0–5 cm mineral soils. Forest topsoil SOC content decreased and became chemically more recalcitrant with increasing MAT, without apparent changes in the physical fractions of SOC. Changes in soil organic carbon (SOC) with climatic factors and vegetation have been a subject of broad interest in assessing the impact of global change on ecosystem C balance and in devising management strategies for sequestrating carbon dioxide (CO2) using natural systems. Soil stores about three quarters of the organic carbon contained in terrestrial ecosystems, and climate-driven changes to this pool could have a large impact on atmospheric CO2 (Smith et al. 2008; Stockmann et al. 2013). The fact that some portions of the SOC pool can persist for millennia while others decompose readily can obscure our understanding of the mechanisms controlling the SOC storage (Lützow et al. 2007; Schmidt et al. 2011). Previous studies have indicated that both biochemical resistance and physicochemical protection contribute to differences in decomposability of SOC (see reviews by Lützow et al. 2007; Schmidt et al. 2011). Partitioning SOC into different pools of decomposability could help better predict the dynamics of SOC under climate change (Lützow et al. 2007; Kleber 2010). However, little information is available on how physical fractions and the chemical structures of SOC are related to climate and vegetation types, especially for forest soil, which makes up 39% of global soil carbon storage (Watson et al. 2000). SOC is commonly partitioned into three fractions differing in decomposability and protection mechanisms: active or labile, intermediate or slow, and stable or passive (Sollins et al. 1996; Mayer 2004; Lützow et al. 2006; Schmidt et al. 2011) (Fig. 1). Chemically, the active fractions refer to labile SOC consisting of hydrolysable chemical bonds of saccharides, proteins and their decomposed products; the stable fraction is usually made up of recalcitrant SOC compounds including aromatic or other macromolecules derived from lignin, lipids, waxes, suberins, cutins and pyrogenic organic carbon from thermal degradation (Derenne and Largeau 2001; Lützow et al. 2006; Knicker 2011; Paul 2016). Solid-state 13C cross polarization nuclear magnetic resonance (CP-MAS NMR) spectroscopy can determine the chemical composition of SOC by quantifying the distribution of different carbon compounds and allow comparisons of decomposability among soil samples (Kögel-Knabner 1997; Conte et al. 2002; Pisani et al. 2014). Physically, stable SOC is protected by bonding to soil mineral particles by ligand exchange, polyvalent cation bridges, Van der Waals forces, and H-bonding etc. (Jastrow and Miller 1997; Six et al. 2002a; Eusterhues et al. 2003; Lützow et al. 2006; Dungait et al. 2012); the intermediate or slow SOC is the occluded particle organic matter (POM) which is isolated by aggregation formation (Christensen 2001; Six et al. 2002b, 2004; Lützow et al. 2006; Gupta and Germida 2015); and the active SOC is non-protected and its decomposability is considered to be determined by chemical structures (Sollins et al. 1996; Mayer 2004; Lützow et al. 2006; Schmidt et al. 2011). The protection occurs in ways of blockage of microbial access and reduced diffusion of enzyme and oxygen into the intro-aggregate space (see review by Lützow et al. 2006). Fractionation of SOC can identify the type of physical protection (Golchin et al. 1994; Six et al. 2002a, 2002b, 2004; Lützow et al. 2007; Paul 2016). Previous studies have shown that SOC associated with clay and silt has older age or longer turnover time than the non-protected SOC (Chenu and Stotzky 2002; Eusterhues et al. 2003; Lützow et al. 2006; Wagai et al. 2009). Many factors can affect SOC stocks and composition. 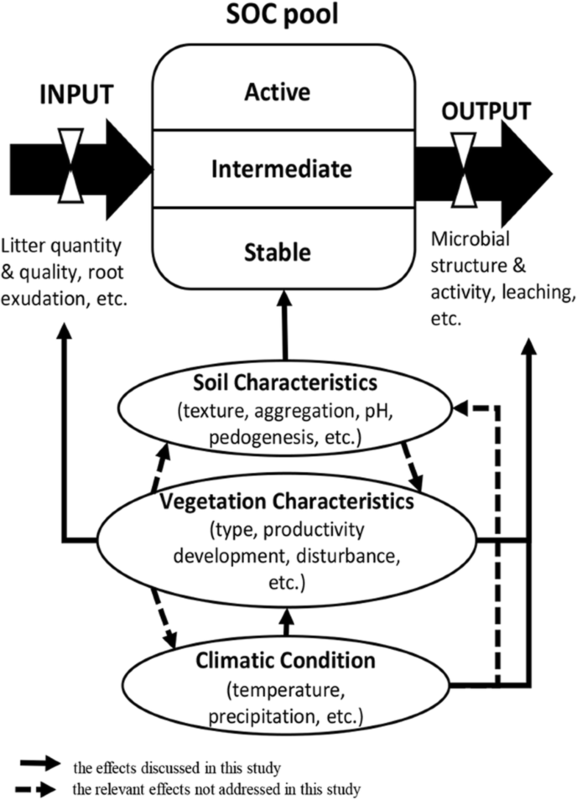 Climate affects forest SOC by shaping both SOC input (changing plant productivity) and output (affecting soil microbial and faunal metabolism) (Fig. 1); the overall response of SOC to climate change depends on the balance between these two processes (Smith et al. 2008; Stockmann et al. 2013). However, most researches on responses of SOC to warming have primarily focused on decomposition, neglecting the SOC input (Bradford et al. 2016). How and to what extent climate regulates forest SOC fractions and chemical structures are still under debate. There are believes that, as mean annual temperature (MAT) rises, the labile forest SOC is more easily decomposed and the recalcitrant SOC components tend to accumulate, making the SOC pool overall more resistant to decomposition (Garten and Hanson 2006; Fissore et al. 2008; Garten 2011; Du et al. 2014; Pisani et al. 2014; Tian et al. 2016). Some are of the view that the recalcitrant forms of SOC would have similar sensitivity or are more sensitive to temperature than the labile forms (Fierer et al. 2005; Fang et al. 2005; Conen et al. 2006). The contrasting views might arise by considering the temperature sensitivity based on decomposition of compounds versus that inferred from pool behavior. Temperature sensitivity of decomposition reactions does increase with the compound complexity, much of the recalcitrant pool is physically protected from decomposition (Davidson and Janssens 2006; Conant et al. 2011), yielding little or no change of SOC in response to MAT (Giardina and Ryan 2000). Vegetation affects the SOC pool size through differential quantity and quality of organic matter inputs and modification of soil microbial community composition (Quideau et al. 2001; Stockmann et al. 2013; You et al. 2014; Castellano et al. 2015) (Fig. 1). Although it is generally believed that the physio-chemical protection, not the initial chemical composition, may be the dominant factor controlling SOC decomposition (Lützow et al. 2007; Schmidt et al. 2011), litter quality can affect SOC stabilization by affecting the microbial processes in the initial decomposition stage (Prescott et al. 2000; Pisani et al. 2013; Castellano et al. 2015; Wang et al. 2015, 2016; Zhang and Zhou 2018). Vegetation community structure may also affect SOC pool size by altering both micro-environment and soil characteristics (You et al. 2014). Soil characteristics such as mineral type, pH and texture can affect SOC composition. Soil mineralogy alters the chemical protection of SOC by controlling the number and type of chemical bonds formed with organic carbon (Lützow et al. 2006; Jones and Singh 2014; Johnson et al. 2015; Paul 2016). In acidic soil, mineral particles with Fe, Al and Mn oxides bind with organic carbon through ligand exchange, protecting the SOC from decomposition (Mikutta et al. 2006; Kögel-knabner et al. 2008; Jones and Singh 2014). Binding of SOC (usually the alky-C) with clay particles usually leads to a longer mean residence time (MRT) compared to SOC binding with larger soil particles (Lützow et al. 2006; Paul 2016). However, there are research findings indicating that soil characteristics would also be affected by climate (Mathieu et al. 2015), and soil pH and cation exchange capacity (CEC) may both decline with increasing MAT (Fissore et al. 2008). Here we compared the physical fractionations and chemical composition of SOC in the 0–20 cm layer of the mineral soil in eight wet forests for three climatic zones in China to address three questions: 1) In forests rarely experiencing soil water deficit, does SOC and its physical and chemical fractions vary across forest sites differing in MAT? 2) Can any pattern of SOC and its fractions with temperature across sites be isolated solely to temperature, or do other factors, such as vegetation type, organic matter inputs or soil texture, help determine the pattern? 3) Can the patterns of SOC and its physical or chemical fractions with MAT suggest how SOC might change with climate warming? We hypothesized that: 1) as SOC decomposition is predominantly a microbial-driven process, increases in temperature would facilitate soil microbial activities and the kinetics of soil extracellular enzymes, thereby causing declines in forest SOC stocks along the gradient of increasing MAT (Davidson and Janssens 2006; Conant et al. 2011; Stockmann et al. 2013); and 2) because of the differences in physical protection and/or chemical recalcitrance, changes in MAT of the study sites would lead to differential partitioning of SOC fractions such that the higher MAT sites would have greater proportions of physically protected SOC fractions and C compounds of greater chemical stability compared with the lower MAT sites. Our study sites extend across three distinct climatic zones in China, including the Dinghu Mountains National Nature Reserve (23.09°N, 111.30°E) of subtropical climate (MAT of 20.8 °C, mean annual precipitation (MAP) of 1990 mm), the Baotianman National Nature Reserve (33.20°N, 111.46°E) of warm temperate climate (MAT of 15.1 °C, MAP of 855 mm), and the Changbai Mountains National Nature Reserve (41.41°N, 127.42°E) of cool temperate climate (MAT of 2.1 °C, MAP of 740 mm) (Table 1). These sites belong to Chinese humid zones (Zhao et al., 2010), and rarely experience soil water deficit. The subtropical site has three forest communities: a mature monsoon evergreen broadleaved forest protected from anthropogenic disturbance for more than 400 years with an overstory dominated by Castanopsis chinensis, Schima superba and Cryptocarya chinensis, a mixed pine-broadleaved forest existed for 60 years and originated from a planted Pinus massoniana that was naturally colonized by broadleaf species, and a conifer forest of Pinus massoniana (Zhou et al. 2005; Zhang et al. 2013). The warm temperate site has both natural deciduous broadleaved forests dominated by Quercus aliena, and mixed forests of Quercus aliena and Pinus armandii that developed from plantations established around 1956 (You et al. 2014, 2016; Wang et al. 2015). The cool temperate sites contains coniferous forests with Picea jezoensis, Abies nephrolepis and Larix olgensis in the overstory, mixed conifer broadleaved forests with Pinus koraiensis, Tilia amurensis, Acer mono, and Fraxinus mandshuric in the overstory, and broadleaf forests that regenerated after logging in the Pinus koraiensis forests, commonly with an overstory of Betula platyphylla and Populus davidiana (Wang et al. 2004; Liu et al. 2009; Yang et al. 2010). Climate and soils of the eight representative forests are described in Table 1. Five 20 m × 20 m plots were established and sampled for each forest type within each climatic zone. The plot locations were determined within a representative forest stand and kept at least 0.5 km apart from each other. The soil effective Fe content was extracted by 50 mL 0.1 M HCl in of 10 g soil sample and tested by inductively coupled plasma atomic emission spectrometry (ICP-AES) (ICAP-9000, Jarrell-Ash, USA), and soil texture was identified by wet sieve (to separate sand fraction) and centrifugation (to separate clay and slit fraction). We also conducted literature search and collected published data required in our study. Soil samples were collected once from five plots in each of the eight forest ecosystems across the three climatic zones from May to June of 2013. In each plot, twenty-four soil cores of 0–5, 5–10 and 10–20 cm mineral soil layers were collected with a stainless-steel soil sampler (3-cm inner-diameter) following an “S” path. Individual soil cores from the same plot were mixed to form a single composite sample, sieved to pass a 2-mm mesh, and air dried. 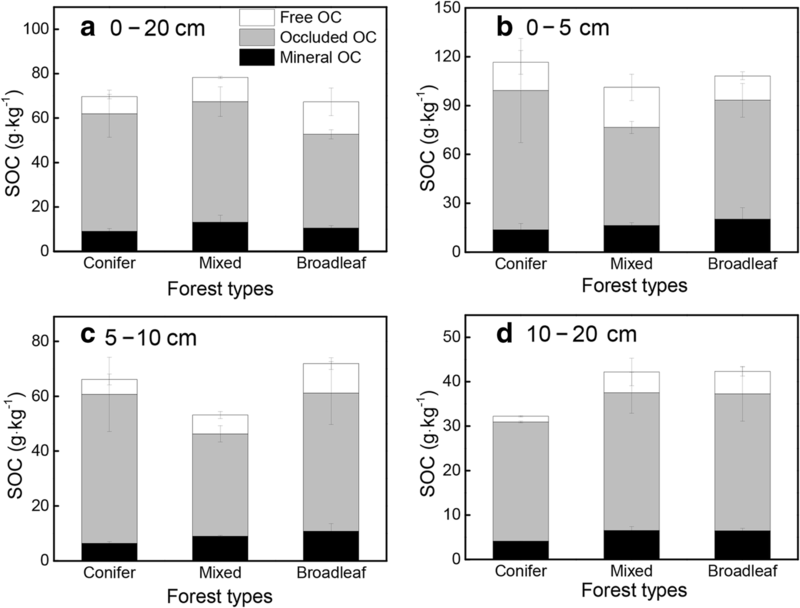 To better understand how soil stabilization differed with site (climate) and forest type, we partitioned the SOC pool into three physical fractions of organic carbon (OC): mineral (bound) OC, free OC and occluded OC (Golchin et al. 1994; Lützow et al. 2007). The mineral OC refers to the fraction of SOC bonded to soil silt and clay particles (< 53 μm), and represents the most stable component of SOC. The mineral OC was estimated by dispersion with 50 mL of 6% H2O2 and 50 mL of 0.5 mol∙L− 1 NaOH and filtration by a 53 μm filter (Mikutta et al. 2005). The residue passing through the filter was collected as the mineral-bound SOC, dried at 40 °C and weighed. The free OC is the light fraction of SOC, which occurs as the most labile carbon pool. The free OC fraction was determined by density fractionation with sodium iodide at a density < 1.6 g·cm− 3 (NaI) (Sollins et al. 2006). The suspended material (density < 1.6 g·cm− 3 fraction) was filtered under suction and the filter residue was collected, dried at 40 °C, and weighed to estimate the free OC. The occluded OC is the fraction of SOC protected in soil aggregates, calculated as the difference between the total SOC and the sum of free OC and mineral OC, and represents the SOC of intermediate decomposability. The C content for the free OC, the mineral OC, and the original soil samples were analyzed by the K2Cr2O7-H2SO4 calefaction method (Nelson and Sommers 1982). Solid-state 13C CPMAS NMR was used to determine the chemical composition of SOC in the 0–5 cm soil layer, as this layer had the highest SOC content. The NMR spectra were obtained at a frequency of 100.38 MHz on a Bruker Avance III 400 M with a 4 mm MAS probe (Bruker Avance III 400 M, Bruker, Switzerland). To reduce the paramagnetic material and increase the organic matter content, 50 mL of 10% hydrofluoric acid (HF) was added to 5 g soil sample, the suspension was shaken for one hour, centrifuged for 10 min at 3000 rpm∙min− 1, and the supernatant discarded, this procedure was repeated eight times, and the precipitate was then washed four times by distilled water and dried at 40 °C (Schmidt et al. 1997). In the 13C CPMAS NMR operations, this HF-pretreated soil sample material was spun at 5 kHz in a ZrO2 rotor (o.d. = 4 mm) at the magic angle with a contact time of 3 ms and a recycle delay time of 1 s. The chemical shift reference was glycine (176.03 ppm). Spinning side-bands were eliminated using the total suppression of side bands (TOSS) sequence. 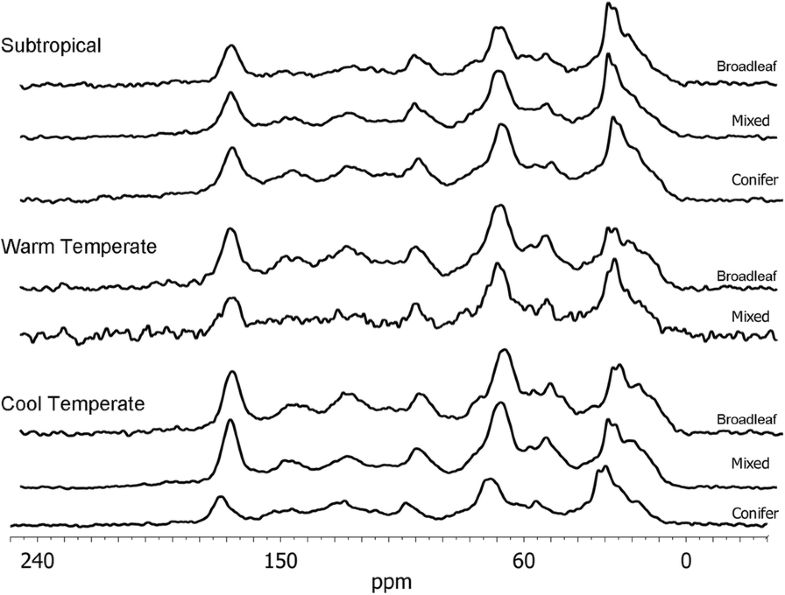 The 13C CPMAS NMR spectra were plotted between − 100 and 300 ppm, and spectra were divided into six chemical shift regions representing alkyl C (10–45 ppm), O-alkyl C (45–90 ppm), acetal C (90–110 ppm), aromatic C (110–140 ppm), phenolic C (140–160 ppm), and carboxyl C (160–200 ppm; Baldock et al. 1990). The labels assigned to each region are considered to be only indicative of the dominant C type present. The total signal intensity and the proportion contributed by each C type were determined by integration of spectral regions. Alkyl C (10–45 ppm) is commonly derived from long-chain lipids and aliphatic biopolymers, such as suberin, cutin and resin, and it is considered to be the most stable part of SOC (Skjemstad et al. 1983; Oades 1995; Kögel-Knabner 1997; Krull and Skjemstad 2003). O-alkyl C (45–90 ppm) generally consists of proteinaceous structures and secondary alcohols, and acetal C (90–110 ppm) represents deoxygenated (anomeric) polysaccharides. Both are derived from cellulose and other carbohydrate decomposition and are readily decomposed (Baldock et al. 1990; Krull and Skjemstad 2003). The aromatic (110–140 ppm) and phenolic (140–160 ppm) regions are derived from lignin, tannins and charcoal, and are difficult to decompose (Skjemstad and Dalal 1987; Skjemstad et al. 1996; Krull and Skjemstad 2003). Carbonyl C (160–200 ppm) typically consists of amides, carboxylic acids and esters which can be readily decomposed (Baldock et al. 1990; Krull and Skjemstad 2003). We calculated the ratio of alkyl C to the sum of O-alkyl C and acetal C (A/O-A) as an index of the decomposition state of SOC; and high values of A/O-A represent highly decomposed SOC; this index is positively correlated to SOC stability (Wang et al. 2010; Du et al. 2014). Because site was confounded with climate, we considered the different site-vegetation-types (n = 8) as the sample unit for testing the effects of MAT and vegetation type on the total SOC, chemical composition and physical fractions with ANOVA. If significant ANOVA differences were present for the effect of MAT, we used an orthogonal polynomial contrast to test for a linear pattern. All data were analyzed using SPSS Version 19.0 with α < 0.05 for accepting significance, unless otherwise specified. MAP for the past 20 years varied from 690 to 850 mm at the coolest site to about 2000 mm at the warmest site (Table 1). SOC concentration of the mineral soil in the 0–20 cm layer varied across sites and vegetation types, ranging from 54.9 to 104.2 g·kg− 1, and total soil N was highly correlated with SOC (r = 0.97). Soils were mostly silt (65% averaged across sites), with the sand fraction varying from 6.1% to 45.1% and the clay fraction varying from 4.8% to 13.7% across sites (Table 1). The total SOC concentration in the mineral soil of the 0–20 cm layer differed among locations (p = 0.04) and had a negative linear relationship with MAT (p = 0.01; Fig. 2a). The value of total SOC concentration was 57.7 g·kg− 1 at the warmest site, 35% lower than the SOC concentration of 89.2 g·kg− 1 at the coolest site. A linear fit to the MAT gradient gave an average rate of reduction in the total SOC of 1.87% with 1 °C increase in MAT. All three physical fractions of total SOC trended lower as MAT increased (32%–41% lower in the warmest sites versus the coolest sites; Fig. 2a), but differences among the sites of different climates were not significant (p > 0.06); fraction composition as percentage of total SOC did not differ among sites (p > 0.76). When pooling the data for all the forest sites (n = 8), SOC and all its three physical fractions had significantly negative linear relationships with MAT (p < 0.01). Among the three subdivided soil layers, only the 0–5 cm layer displayed a significant decrease (p = 0.01; Fig. 2b) in the total SOC with increasing MAT, at an average rate of 2.91% reduction with a 1 °C increase in MAT. The physical fractionations of the different soil layers did not vary across sites, except for the occluded OC in the 10–20 cm layer being highest at the sites with MAT of 15.1 °C (p = 0.046; Fig. 2d). The chemical composition of 0–5 cm SOC, inferred by the proportion of each chemical fraction in total SOC, did not differ among forest types (p > 0.26) or vary with MAT (Figs. 3 and 4). SOC was mostly composed of O-alkyl C (mean = 32%) and alkyl C groups (mean = 26%), followed by aromatic and carbonyl C (mean = 13% both), acetal C (mean = 9%), and phenolic C (mean = 8%). The percentages of aromatic C and phenolic C have a tendency of decreases with MAT, while the percentage of alkyl C and the value of A/O-A showed a tendency of insignificant increases (p > 0.13, Fig. 5). When pooling the data for all the forest sites (n = 8), alkyl C and A/O-A value had significantly negative linear relationships with MAT (p < 0.05) and aromatic C had a significantly positive relationship with MAT (p < 0.01). Are factors other than temperature important in the MAT response of SOC? Averaged across the sites of different climates, SOC concentration showed no apparent pattern with vegetation types. The total SOC concentration and the concentration of mineral OC, free OC and occluded OC fractions did not differ among forest types for either the whole profile of 0–20 cm soil layer or the subdivided soil layers of 0–5, 5–10 and 10–20 cm (p > 0.98; Fig. 6). The decreasing pattern in total SOC concentration with MAT across sites of different climates was accompanied by changes in the organic matter input (litter) and output (soil microbial respiration) and soil characteristics (effective Fe content). 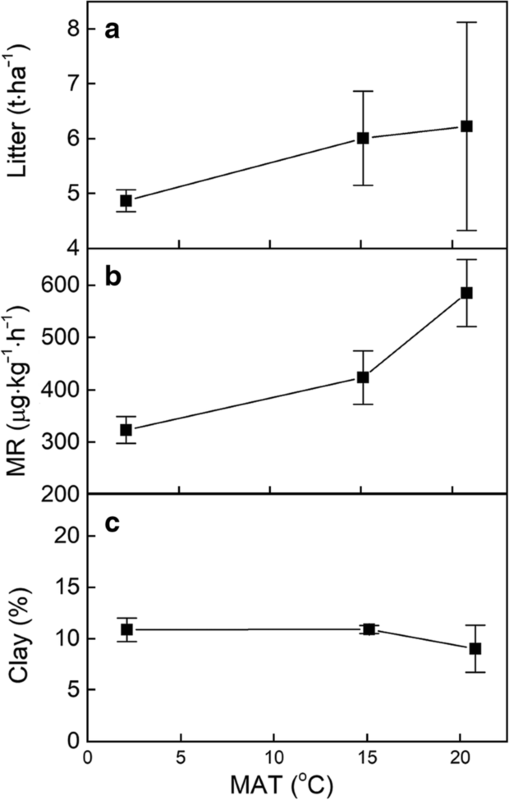 Both annual litterfall and soil microbial respiration increased with MAT (linear orthogonal contrast p = 0.01 and 0.02; Fig. 7a and b), evidence that a decrease in SOC concentration with MAT did not result from the changes in either organic matter input or output, but a balance between the input and the output. The soil effective Fe content also increased with increasing MAT (linear orthogonal contrast p = 0.02; Fig. 5f), but soil clay content did not vary with MAT (linear orthogonal contrast p > 0.51; Fig. 7c). There have been some on-going debates as what controls the decomposability of SOC. And results from previous studies demonstrated either declining forest SOC with increasing MAT (Bird et al. 2002; Garten and Hanson 2006; Raich et al. 2006; Fissore et al. 2008; Garten 2011) or no significant variations in the total SOC stocks with MAT (Trumbore et al. 1996; Giardina and Ryan 2000; Plante et al. 2006; Zimmermann et al. 2010). 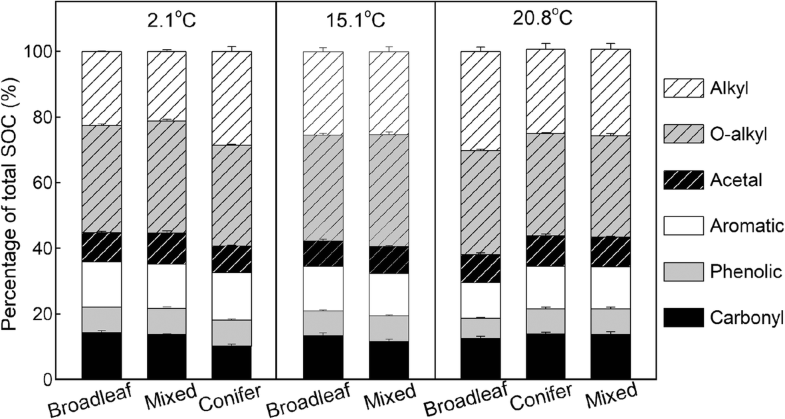 This contradiction might be due to that warmer climate often lend to increases in both plant productivity (SOC input) and soil respiration (SOC output), changes in the SOC stock with temperature are determined by the balance of SOC gain through increased productivity and SOC loss through soil respiration (Raich et al. 2006; Smith et al. 2008; Ziegler et al. 2017). Results in this study also show that the decreasing SOC with MAT is associated with increases in both annual litterfall and soil microbial respiration. So our findings of decreasing total SOC with increasing MAT suggest greater impacts of warming on accelerating SOC decomposition than on increasing SOC input in Chinese wet forests. All physical fractions and chemical fractions of total SOC were not significantly different among the sites of different climates. However, when data were pooled for all the study sites, we found significant relationships in some of variables of the physical and chemical fractions with MAT, with inferences to increased proportion of physically and chemically more stable SOC with increasing MAT of the forest sites. With increasing MAT, the proportions of aromatic C and phenolic C had a tendency of decreases, whereas the proportion of alkyl C and A/O-A value trended higher. As aromatic C is intermediately decomposable and concentrated in the occluded OC pool, and alkyl C percentage and the A/O-A value are positively related to stable soil C (Skjemstad et al. 1983; Oades 1995; Kögel-Knabner 1997; Krull and Skjemstad 2003; Courtier-Murias et al. 2013; Du et al. 2014), our results suggest preferential preservation of C compounds of higher stability with warmer climate. This is supported by findings from some recent studies (Garten and Hanson 2006; Fissore et al. 2008; Garten 2011; Du et al. 2014; Pisani et al. 2014; Tian et al. 2016). Findings largely vary in literature in the temperature response of SOC fractions. 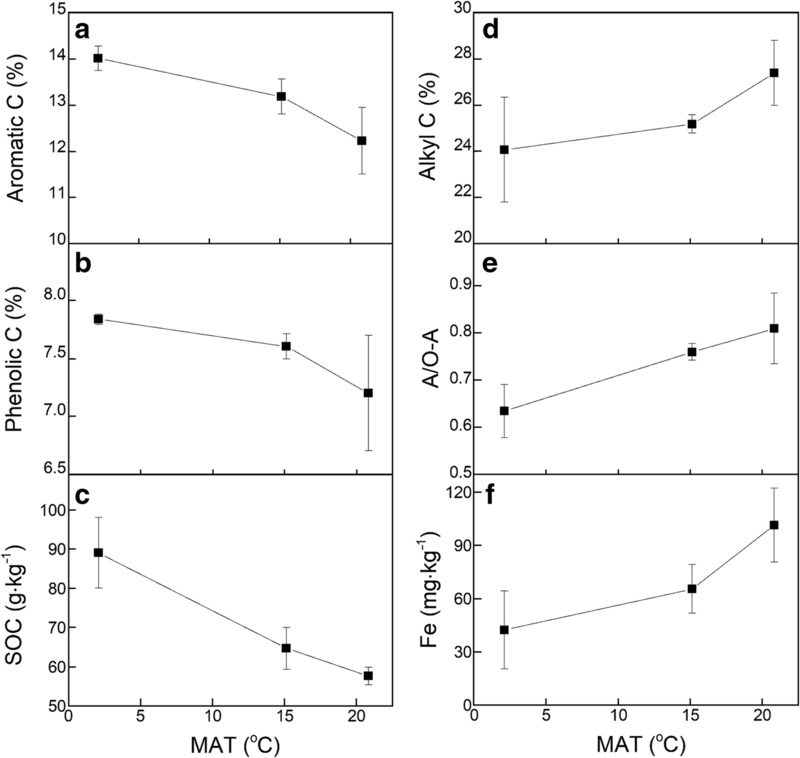 Garten (2011) reported that, in the top soil of five forest sites along a latitudinal gradient with MAT from 6.2 °C to 14.6 °C in North American, the labile POM content decreased by 26% with increasing MAT, but the mineral OC did not show a linear relationship with MAT. Fissore et al. (2009) studied the subpools of SOC across 26 sites under hardwood or pine forests with MAT ranging from –2 °C to 20 °C in North America using incubation and chemical methods, and found that only the active SOC decreased strongly with increasing MAT, while slow and acid insoluble SOC showed no significant relationships with MAT. Hakkenberg et al. (2008) determined the turnover time of different SOC fractions in 11 forests along a MAT gradient from 4.2 °C to 11.8 °C, with findings that the turnover time of heavy and light fractions (stabilized and intermediate pools) decreased at about 8%–16% and 4%–11%, respectively, with a 1 °C increase in MAT. The inconsistency among studies in the relationship of the total SOC or its fractions with temperature may arise from complex mechanisms controlling SOC stocks and processes. The mechanisms of temperature response may vary with the type of SOC fractions. The free OC is physically unprotected and can be temperature sensitive as its enzyme-controlled decomposition increases at higher temperature (Davidson and Janssens 2006; Conant et al. 2011). In contrast, the response of mineral associated SOC to higher temperature may differ with mineral types and bond type (Conant et al. 2011). While several types of mineral-OC bonds would desorb with warmer temperatures, stronger ligand exchange bonding might also occur (ten Hulscher and Cornelissen 1996; Pignatello 1999; Conant et al. 2011). The mechanism of the temperature response in aggregated OC is unclear (Plante et al. 2009). We found no apparent effects of forest type on the total SOC and its physical fractions and chemical groups. Among the soil variables studied, only the effective Fe, which is often positively related to soil mineral OC (Mikutta et al. 2006; Kögel-Knabner et al. 2008; Jones and Singh 2014), displayed a similar trend with changes in the proportion of alkyl C and the A/O-A value with MAT. The soil clay content, which is commonly positive related with stable SOC (Lützow et al. 2006; Plante et al. 2006; Jones and Singh 2014), did not vary with MAT. Therefore, the declining SOC with increasing MAT is predominantly a temperature response. In this study, the effects of vegetation and water limitation were controlled by including broadleaf forest, conifer forest and mixed-wood forest and restricting the study sites to humid regions. There possibly exist other confounding factors such as differences in soil types, pedology, and microbial communities resulting from geographical separations and long-term climatic influences. However, our laboratory testing indicated that SOC mineralization was mostly affected by initial soil substrate (Tang et al. 2018). Matching laboratory-derived carbon fractions with the SOC models might better predict changes in SOC with climate (Motavalli et al. 1994; Smith et al. 2002; Poeplau et al. 2013). However, evidence for that contention is mixed. The current study did not reveal a clear and straightforward relationship between SOC composition and its temperature response. Therefore, the patterns of total SOC and its fractionations with MAT are insufficient in informing how SOC might change with climate warming. Integrating information of soil physiochemical properties, SOC fractionations and their interactions with decomposer communities could help to achieve a better understanding in SOC dynamics with changing environmental conditions (You et al. 2014, 2016). Globally, forest soil stores about 704 Pg organic carbon (Lal 2005), about 50% of which is in the top 20 cm soil layer and 14% in the 0–5 cm mineral soil layer (Jobbágy and Jackson 2000). If the relationship for SOC found across sites with different MAT holds for other forested sites, we estimate that by end of the twenty-first century, the top 20 cm mineral soil (1.87% reduction rate) in forests worldwide would contribute from 6.58 Pg C to the atmosphere under RCP 2.5 (1 °C increase in global mean air temperature with stringent GHG mitigation), to as much as 26.3 Pg C under RCP 8.5 (4 °C increase in global mean air temperature with very high GHG emissions). By considering only the top 5 cm soil layer, the loss of SOC would range from 2.87 Pg C under RCP 2.5 to 11.5 Pg C under RCP 8.5. By any means of accounting, the contribution of forest soils to the atmosphere resulting from warming would likely outweigh the current terrestrial plant uptake from forest regrowth. A marked shift in carbon balance between forest ecosystems and the atmosphere would impose positive feedback to global climate change. Our overall findings raise a key issue of consideration in managing forests for carbon sequestration, and highlight the need in technological development for stabilizing forest SOC with changing climate. We assessed the long-term effects of temperature, litter inputs, soil characteristics and vegetation type on the SOC content of the 0–20 cm soil layer and its fractions across three wet forested sites of contrasting climatic zones in China. The total forest SOC in the 0–20 cm soil declined with increasing MAT, and annual litterfall and soil microbial respiration increased with increasing MAT. A preferential preservation of C compounds of higher stability with warmer climate was found, and this might be caused by easily decomposed labile SOC and accumulated recalcitrant SOC components with increasing temperature. We found no apparent effects of forest type on the total SOC and its physical fractions and chemical groups, and only the effective Fe displayed a similar trend as the proportion of alkyl C and the A/O-A value with MAT. X. Sun acknowledges the financial support of the China Scholarship Council for academic exchange in USA. We thank the Changbai Mountain Forest Ecosystem Research Station, Baotianman Long-Term Forest Ecosystem Research Station, Dinghushan Forest Ecosystem Research Station and Institute of Chemistry Chinese Academy of Sciences for access to the study sites, logistic assistance and sample analyze, and we thank the Institute of Chemistry Chinese Academy of Sciences for helping with the NMR analyze. This study was supported by the National Natural Science Foundation of China (Grant No. 31470623) and the National Basic Research Program of China (Grant No.2011CB403205). OJS and XS designed the research. Data were collected and analyzed by XS, ZT and YY. Manuscript was prepared by MGR, OJS and XS. All authors read and approved the final manuscript.